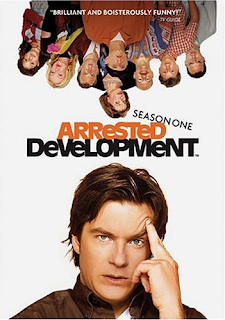 A Follow Spot: Can Netflix Save "Arrested Development"? Mitchell Hurwitz and others associated with the TV show "Arrested Development" have been teasing a movie version of the cult classic comedy series for ages. But now, out of the blue, executive producer Ron Howard and the folks at Netflix have announced that new episodes of "Arrested Development," presumably involving most of the cast from its original Fox incarnation, will be streaming at Netflix come 2013. You can read more about it at TVLine or Entertainment Weekly. Netflix is the service that used to send out DVDs as well as stream movies and TV shows online for one (fairly low) monthly subscription charge, making them quite popular and seriously damaging brick-and-mortar video stores like Blockbuster. But then Netflix decided they couldn't make a go of it doing both videos-by-mail and videos-on-line, so they split those services, announcing that they were now charging for them individually, effectively raising their prices by 60%. Netflix subscribers deserted them in droves, and they've been trying different things to get them back. Now, apparently, they're going to attempt original programming. In the EW article by James Hibberd, it was noted that Netflix will be offering new episodes of a British series called "House of Cards" as well as "Arrested Development." I have to be honest, when it comes to "Arrested Development," the promise of new episodes just might be enough to get me back to Netflix. Now if only they could do something about "One Life to Live." Oh, I hope so! We LOVE Arrested Development at our house. I've read elsewhere that this is going to be just ten episodes, as a ramp-up to the movie. I don't care -- I'll take what I can get when it comes to Arrested Development. I LOVE that show!